They turned out pretty cute and I think I will make another pair in a different color. 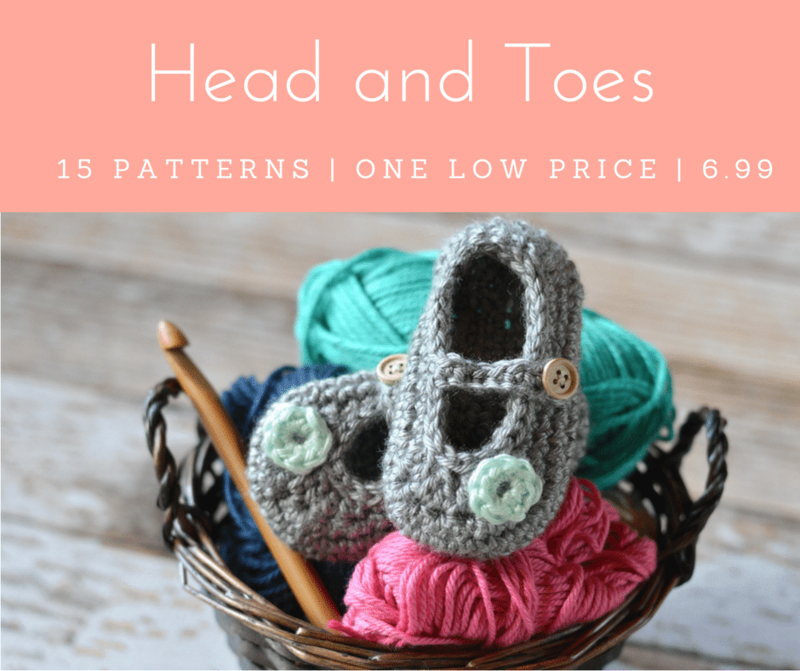 I wrote the pattern for size 8, but sizing up should be pretty easy for you as I included instructions. By using this free pattern, you are agreeing to NOT redistribute this pattern (whether electronically or by printing and handing out copies). Sharing is a form of theft! If you would like to share, please direct others to my page. Pageviews enable me to publish my patterns for free, so please help me to continue to do so. You are free to sell items you make from this pattern! 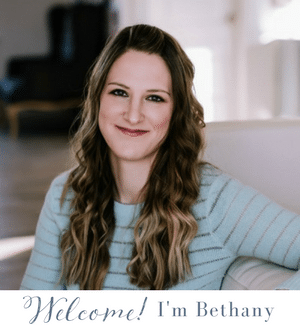 By using my pattern and selling your items, you are also agreeing that you will give credit by adding a link to the original blog post in each individual listing, or on your tags. And DO NOT use my photos to sell your items. Thank you! Sole: Make two sole pieces for each shoe, 4 total. (approx. 9 ¾” long) The sole is worked in the round. Match up your two sole pieces and using a loose sl st, stitch the two soles together, going through both loops of each sole. Use the color you want the slipper body to be. 1. Start your round on 18th st from the middle of the toe. Face the toe downwards and count 18 to the right. Going through the sl st loops and working towards the toe: Ch 1. Sc in same st. Sc 50. Hdc 7. Dc 8. Hdc 7. Sc 15. (88 sts) Join with sl st.
2. Ch 1. Sc in same st. Sc 50. Hdc 7. Dc 8. Hdc 7. Sc 15. (88 sts) Join with sl st.
4. Ch 1. Sc in same st. Sc 4. Sc2tog twice. (Sc 2. Sc2tog) Twice. Sc 2 . Sc2tog twice. Sc 17. Hdc 7. Dc2tog. Dc 4. Dc2tog. Hdc 7. Sc 15. (69 sts) Join with sl st. Secure end and tie off. Sc all around your flap. Tie off but leave a long tail. 2. Ch 1. Sc in same st. Sc 12. Sc 5 in the 5-ch-loop. Sc 13. Turn. 3. Ch 2. Hdc in same st. Hdc 12. Hdc 2 in the 5 sts around the loop. Hdc 13. Leave your long tails. ***To make a different size, go up or down 2 ch on your foundation ch. Make sure to adjust accordingly on the sides. The toe and heel should NOT be changed, just the length. Be sure you make the entire soul for sizes 5, 6, 7 in single crochet stiches to make it narrower. Keep in mind, if you are changing the length of the ch by two, your entire round/row count will go up/down 4 sts. Working size 8… At the end of round 5(sole) I have 90 stitches… instead of the 88 shown… where can I add the stitches for the body of the shoe? I would add one on each long, straight side of the slipper. That’s what I ended up doing. Took a little longer counting and whatnot but I got it figured out. Thanks! I made these slippers for my first “real” project (other than a quick headband). I used navy and gray yarn. These turned out SO CUTE and the pattern was very easy to follow for a first-timer. I really appreciate you sharing your pattern and creativity. Can’t wait to try more of your patterns! I am not sure, I am sorry! I haven’t made that size before, but I have been meaning to make my boat slippers into children’s sizes. Sorry! I have a question about the straps. When beginning the first row, are you doing 1 sc in the 5th ch from the hook then an additional 13 sc for a total of 14 sc? If so, then in row 2, I count 13 sc before the 5 sc in the loop so am I skipping the V right before the loop or should I do a 14 sc before I get too the loop? Thanks for any help. I love your pattern. Super cute. You might be right! Don’t skip stitches, work a st in each st along the length. Is there a video tutorial of this somewhere, my increases keep getting messed up. Are you repeating the entire sequence? I think you aren’t working the increases right. 8 – Just like the pattern you provided. Oh yes! Sorry. Yes, those stitch counts are correct. I love your patterns! I have a question about starting the body of the slipper. I’m left handed and I’m not sure if I start 18 stitches to the right if I will be working in the wrong direction? I am just a beginner so I could be completely wrong lol. Also I am closer to a size 10 so i went up 4 stitches. Am I correct then that the sole is increased a total of 8 stitches all around? How to I account for the increase of 8? Does that change where I start? Should I still begin 18 stitches to the right? Sorry for all the questions and thank you!! I am sorry, I can’t help you with the left-handed part, I would have no idea on that! But the size increase will not change your starting position. As far as sizing up, you will make them longer, so do the toe and heel the same, and just add the extra stitches in the length on the side. Does that make sense? Thank you! When I start the body of the slipper I am crocheting towards the heal. Is that correct? If I am supposed to crochet in the direction of the toe then I think I am going in the wrong way lol. Oh no! Yes, you should be working towards the toe. Make sure the outside (the right side) of your stitches are facing outwards. How did you sew the toe flap in? From the back side? Into the top stitches around the body or underneath? Thanks! From the top, going through the loops on the shoe from the last row. That is what I did, but you can do whatever it easier for you! Love these! However, having problems with the body. Step 3. Sc2tog twice. tog? I’ve never seen this abbreviation before. Is it 2 sc in a single spot? I tried working it that way but it isn’t coming out at the end of the row. It is too short. Thanks! Sc2tog means single crochet 2 together, or a sc decrease. I just finished crocheting the yellow slippers. Your directions are very clear. I will make more of these. Thanks so much! Thanks so much Mary! I appreciate your sweet comment :) I am so glad you like my pattern! Hi! I love the look of these slippers and since nearly every other pattern I’ve tried hasn’t worked out for me, figured I’d give this pattern a shot. However, I’m having a problem with the instructions for the body of the slipper. With the toe pointed down, which I’m guessing is the widest part of the slipper, and counting up 18 to the right, should I continue to crochet up the right side toward the heel and around? Or should I start from the 18th right stitch and crochet down the right side toward the toe and back up around? Thank you for sharing such a cute pattern! If I can figure this pattern out, I will definitely be making more! Thank you! You should work the right side of the sts facing out, so work down towards the toe. 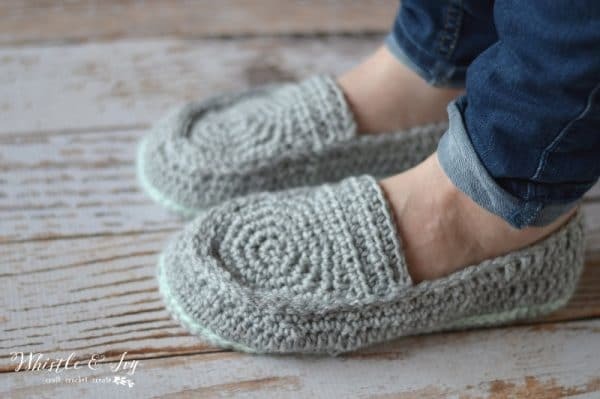 Do you have a pattern for adult Boat Slippers? Love the toddler one and would like to do one for Adults as I do lots of sailing and this would be good in the evening when we are anchored for the night. Thanks so much! No, it should fit your foot. You might need to go up a hook size, if it’s that small. Are you using the suggested yarn? No, I was just using some yarn I have. I’ll try using a bigger hook. Thank you! I am having trouble with the sole. I’m making size 9, and it seems like there aren’t enough stiches to go around. I don’t know if it is something I’m missing or if there really needs to be more stiches. I would appreciate an help I could get. Thank you. Hm. Well I use this sole for all my patterns, so I positive there are not missing stitches. Are you working the first st of the second round in the right st? Oh my goodness! These are so cute! I just made a pair of little slippers for my daughter and I’m so excited to start working on a pair for myself! I like to take different patterns and mesh them together, so hers are a combination of a few of these I found on here, you are such an inspiration, and I’m starting to want to try to experiment some of my own. If I succeed in this pattern I’ll definitely share both these and my daughters with you! I’m new to the crochet game but I love the look of these slippers so I HAD to try them. I’m making them for an upcoming hospital stay (no one likes bare feet in the hospital) and I’m having trouble attaching the soles together. Do you have or know of a picture tutorial, maybe different wording. I’m just befuddled! Thanks!!!!! Thank you! I am sorry you are having trouble understanding. You are basically sl st another row around the sole, except you are putting them together (right sides together) and are working through both loops on each sole (so 4 loops). So when you are done, the two sole pieces are now one, and the sl st will form a color ring around the outside. A sl st is not like other stitches, that build up and make your project larger. This one just lays rather flat, so it will look like it’s flat on the soles, inside of up (or out, depending on how you are looking), like a row of sc would look. I really love your patterns!! 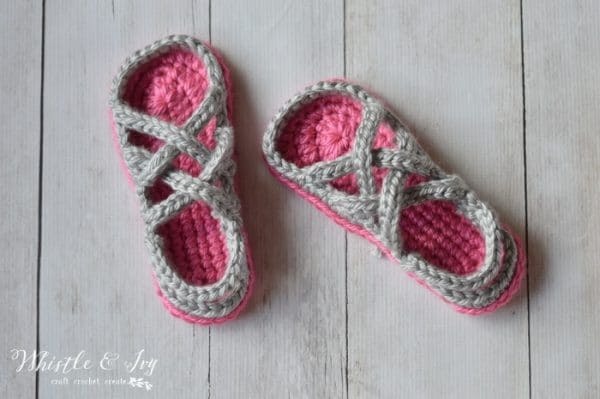 Ive done one of the baby boat slippers and I can’t wait to start on this pair for me! I Love how modern your designs are and they are easy to follow. Hope to see more soon!! I am having trouble with steps 4, 5 , and 6 of the sole. When is says in step 6. (Hdc 3, hdc 2 in the next st) 3 times Im ending up with a very ruffled look on the back edges is that how its supposed to look?? Steps 4 and 5 look reasonably normal but step 6 seriously looks weird. Send you a message on FB! I’m having the same problem with the ruffled look around the heel in row 6. Can you let me know what you told Dalmae? I never could download the women’s boat shoe pattern, it froze the computer up every time. So I’m making the button ones. Delmae was not working the increases correctly, so she was working too many stitches. Is it possible you are doing this as well? You are repeating what it inside the parenthesis respectively. Hdc 2 (each in own stitch) hdc 2 together in the next st, then repeat the sequence around the toe and around the heel. I opened your blog today and it gave me a different link. Looks like the issue may be with my computer. Thanks. Cant wait to start on these. Thank you for sharing them. To my knowledge, yes! It’s just a pdf. Thanks so much! Shoot me an email, and I can get it to you. 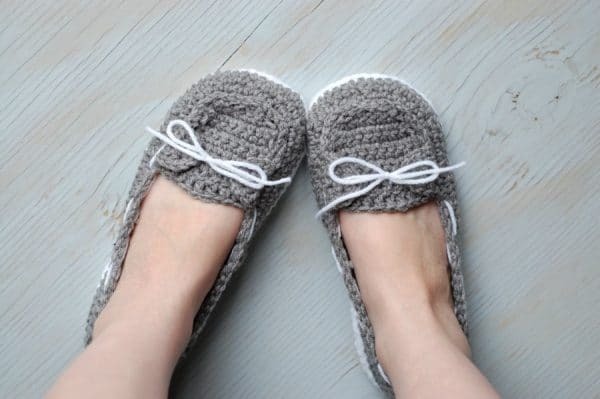 Love these and plan on making a pair for myself and my mom this weekend – any recommendations on the yarn used? Thanks so much! I used Red Heart Medium. I found my mistake!! Thank you for sharing your wonderful gift of creativity with the world!! I love your slipper pattern! I started out pretty good, but I’m having trouble with round 6. I think there should be more sc stitches on the side. Are you working on the original size 8? You are SO welcome! I am glad you like them :) Happy crocheting! So cute! Thanks for sharing the pattern. I made these last night and they fit so well, though the colors I chose are the exact colors of a Giraffe…lol. I have been following your patterns for over a year as they are shared in crochet emails I get. I finally gained enough experience and courage to begin making flip-flops for my three year old and sixteen month old daughters. I was thrilled to realize that these patterns are so easy and elegant. Thank you for sharing with us. I am playing around with what sizes they each need and it has been fun so far. I prefer using a hook one size larger than what you use so that changes the gauge. It has been educational for sure. Do you have the pattern on Ravelry? If so, I can link it up. All linked up! Thank you, again!! These are adorable. I love the colors! I’ll have to trade in my knitting needles for a crochet hook for a little while!